I write to you from Broomfield, CO where I am attending Ohalah, the annual Renewal Conference for Rabbis. This year’s theme is AYEKHA: How do we show up in these turbulent times? I return to New York, inspired by days of learning with colleagues about what it means to serve in today’s tumultuous world. How do we address the injustices, brokenness and despair in our own village while tending to the vulnerabilities in our own Souls? In particular, our plenary yesterday focused on the rise of anti-Semitism and I look forward to bringing this conversation into our Shul community. 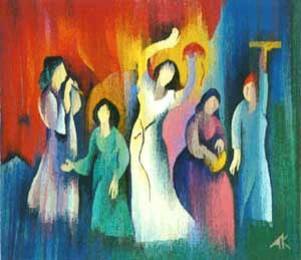 I am even more excited to celebrate Shabbat Shira, the Shabbat of Songs, at the Shul this Friday evening. During our service, we will look at this auspicious Torah portion, Beshalach, which highlights the Song of the Sea, a monumental moment in the history of the Jewish people. Following our Kabbalat Shabbat service, we will continue with a beautiful mystical Tu B’Shevat Seder, celebrating the Jewish New Year of the Trees. In the Kabbalistic tradition, we will eat fruits and taste wines as a way to experience meaning in our own spiritual and physical lives. Please register for the Seder. On Saturday morning, we will meet for our monthly Contemplative Service on West 71st. For those of you planning to attend the Women’s March, please join us as at 10:00 for our monthly communal mindfulness gathering to meditate, pray, sing and nourish our Souls. We will discuss what it means to follow in the footsteps of Miriam, the prophetess who took her timbrel in her hand and led the Israelite women to liberation. 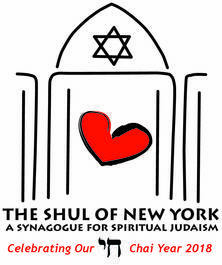 Following Kiddush, those who wish to continue by praying with their feet will join with the independent New York City Women’s March Alliance at Central Park West and W 72nd Street. Register for the Contemplative Service. Register with Women's Alliance for the march . Sending blessings of love, strength and hope as we prepare for this Shabbat.